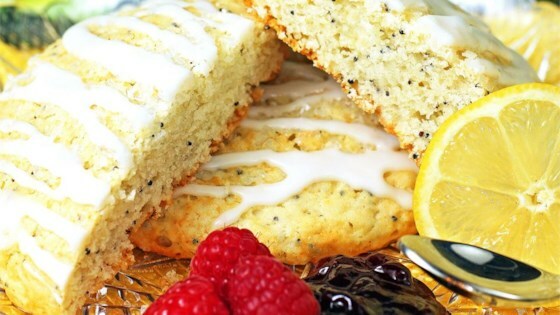 "Delicious lemon poppy scones that happen to be vegan. Note, this recipe can be changed up quite easily. And the proportions are pretty forgiving, too. Experiment with different sweeteners and flours if you like. These are very adaptable." Preheat the oven to 400 degrees F (200 degrees C). Grease a baking sheet. Sift the flour, sugar, baking powder and salt into a large bowl. Cut in margarine until the mixture is the consistency of large grains of sand. I like to use my hands to rub the margarine into the flour. Stir in poppy seeds, lemon zest and lemon juice. Combine the soy milk and water, and gradually stir into the dry ingredients until the batter is moistened, but still thick like biscuit dough. You may not need all of the liquid. Spoon 1/4 cup sized plops of batter onto the greased baking sheet so they are about 3 inches apart. Bake for 10 to 15 minutes the preheated oven, until golden. A classic scone with hints of lemon and poppy! This recipe is extremely flawed. The "dough" all but turns to liquid on the cookie sheet, and I ended up with batter all over the bottom of my oven. Retest this recipe! My vegan sister absolutely loved these! My suggestion is to use only half of the liquid if you want a scone, if you want a poofy cookie, use most of it. Regardless, they were a hit! These were extremely tasty and my husband devoured them! I used all of the milk but only half of the water in the recipe.